Grid systems enable us to properly organize website content. Dividing the screen into multiple rows and columns is the best way to create a variety of layouts for any kind of website. 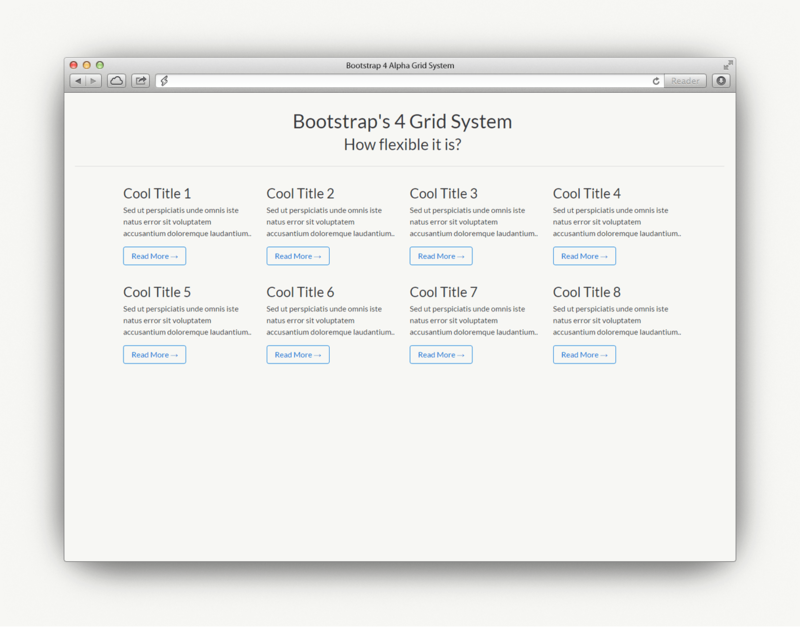 Bootstrap’s grid system has a division of columns ― up to 12 in each row. Each column width varies according to the size of screen they’re displayed in. Bootstrap’s grids are responsive and each rows may collapse at a certain breakpoints or can displayed fluidly across different viewports. Bootstrap allows users to create a vast number of rows depending on the design of the website. In Bootstrap 4, we are working in terms of rem and em units instead of pixels. Though some of the classes name remains, there is a new tier -sm added to better target mobile devices. 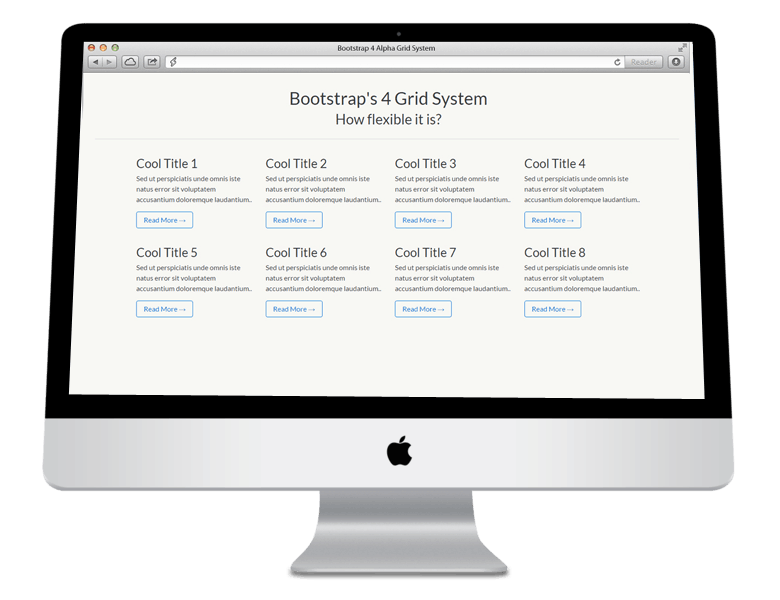 In this article, we will dive in to the grid system of Bootstrap 4. You will learn how the grid system works and how you can use it in your website or project. At the end of this article, we will create some sample website layouts in order to understand it better. 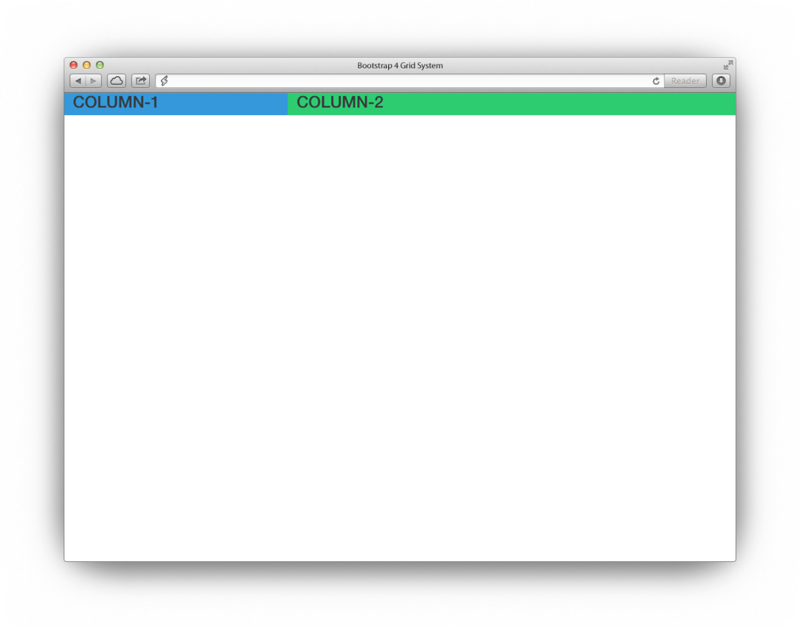 We’re going to create a basic grid layout using Bootstrap’s grid system. First, you need to create an index.html file and copy and paste the basic markup below. Next, we’ll create a row class inside a container. Once the row is defined, we can start creating the columns. You can place a series of rows inside a container. Tip: For enhanced results, it is recommended to have a single container with all of the rows inside to wrap everything and center elements on the screen. Next, let’s talk about columns. Bootstrap columns can be created by specifying the col class and its prefix sizes adding up the scales of 12. Let’s say we want to have only a single column. 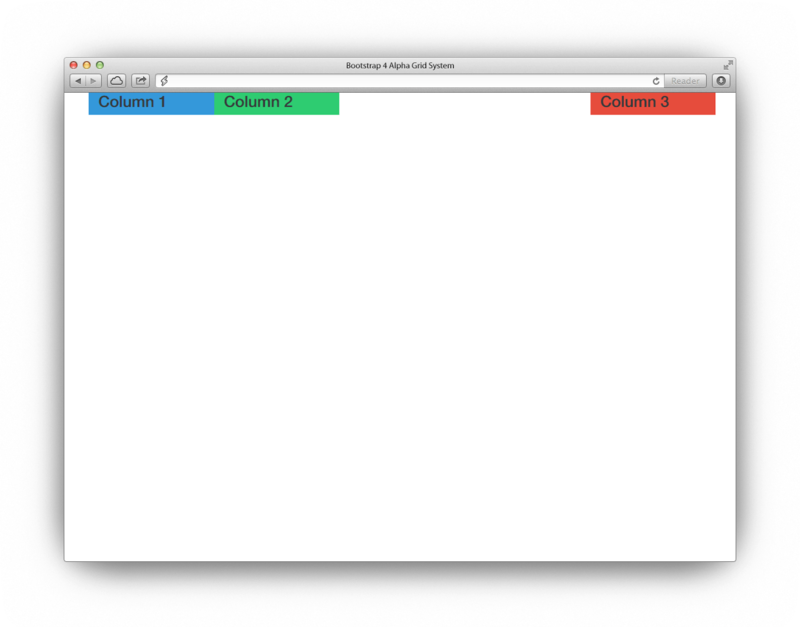 It should span across all twelve available Bootstrap columns. So we can use class col-xs-12, with the number 12 specifying the amount of columns to span. As an example, let’s create three equal-width columns in a row, we’d use the class col-xs-4 for each one. 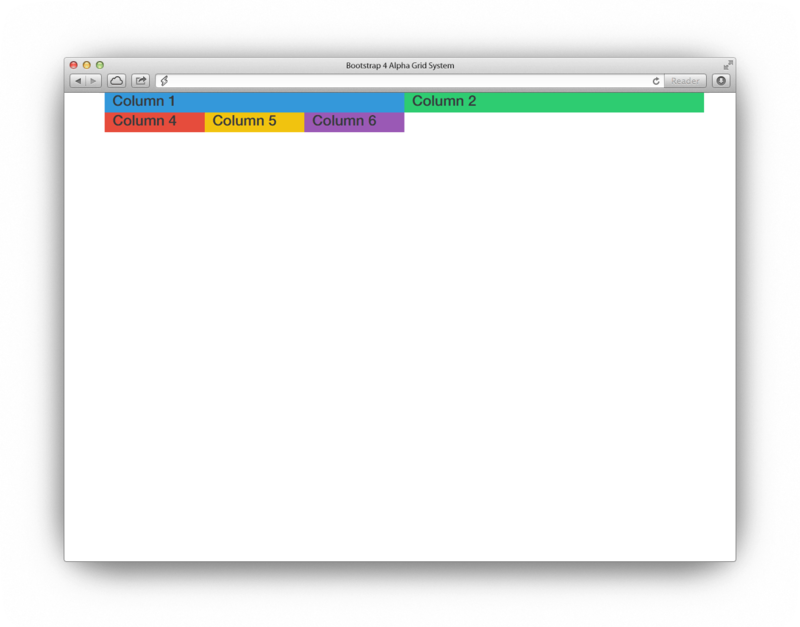 This tells Bootstrap that we want three columns that span across six of Bootstrap’s columns. Check out the code below. Note: I added the custom class col-1, col-2, col-3, to our markup so that the columns pick their respective CSS styling. To make it obvious how these columns works, let’s give each custom class a background color. Let’s add some internal styles on our head section. Add the following styles just before the closing </head> tag. With the code above you’ll see exactly the same output below. On our code above, we specify the class col-sm-4, it means the element should span all three grids (adding up to 12 columns) for each of the available Bootstrap columns on small screens. So that is easy, but what if we want this to behave differently on large screens? In the above code, we haven’t specified how the div should span on larger screen types. 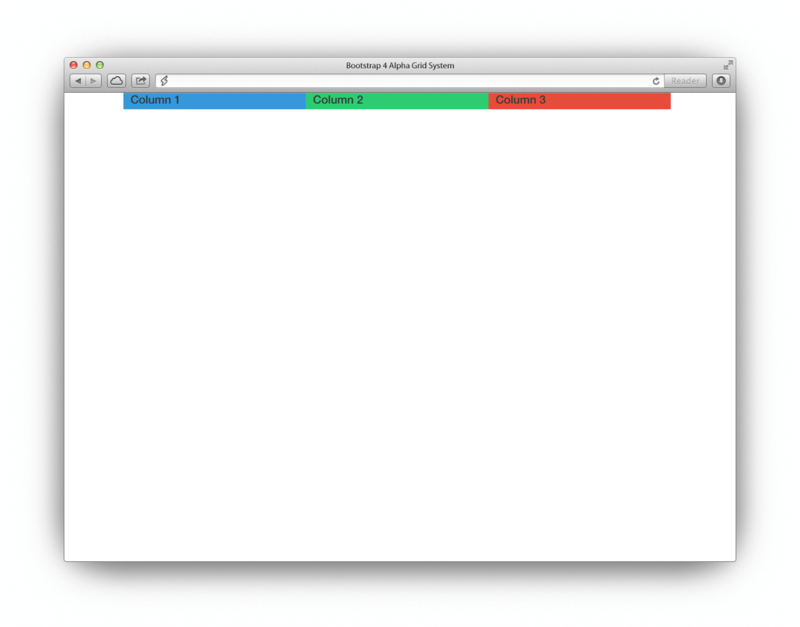 By default Bootstrap will automatically setup the layout for the larger screen size. Let’s check out the code below. In the code above we set up the class col-lg-12 for larger display (screen width 62em and up) and class col-sm-4 for a smaller screens (screen width 34em and up). That means on smaller screens each column will have three Bootstrap columns, while on larger screens they will occupy the 12-column layout. See the result below. In this section, let’s see how we can create a flexible layout for desktop, tablet and mobile devices. Our final output will be like this image. In our output image, we place a header on the center of the screen and then set up a four-column layout containing dummy text. Let’s see how it will look like on different screen sizes. As you can see on our desktop view we have four columns, while there are two columns on tablet view and one column for mobile view. First, let’s create a new HTML file named grids_view.html. We will then place our basic markup below. Don’t worry it’s actually almost the same markup we set up on our first example. Nothing special here. Desktop displays are mostly larger than 1080px. For this part, we will be using the class with prefix col-md-* to for our columns in desktop screens. You may also use the col-lg-* and col-xl-* prefix. After all it have no additional effect on the layout for larger displays that are larger than 1200px. Let’s create a div container and a row class first. Then inside it we will create eight columns with col-md-3 class. Inside each columns we’ll just set up an h3 tag, a text and link. Let us not forget to add a header section for our and then place col-md-12 class to expand it all over the screen. Sed ut perspiciatis unde omnis iste natus error sit voluptatem accusantium doloremque laudantium..
Add custom styles to make our grids a bit presentable. These are just basic fixed. The output will look exactly the image you see on the desktop view. Next, let’s work on the tablet view. Add extra code to the code above to achieve our layout for tablets. Unlike desktops, tablets can display the columns in either portrait or landscape view. The landscape view can be achieve with a col-md-* classes but for a portrait we can use col-sm-* classes. 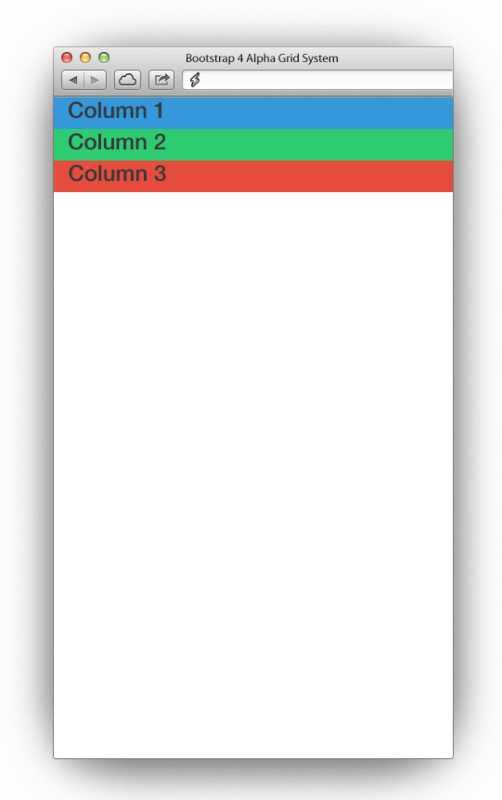 For this part, we’re going to achieve two column layout in smaller displays using col-sm-6 classes. We need to display column to span across Bootstrap columns so that the remaining columns will just be displayed on the next rows. Copy and paste the code below. Note: The result of the code below will look exactly the image of a tablet image above. For the mobile view can use the col-xs-12 class. The landscape view in mobile devices uses small-sized displays and can be taken care of using col-sm-* classes while the portrait can be handled by col-xs-* class. So since this is actually a smaller version of our grids, we will display one column per row. Check out the code below. Check out the result of these code on the iPhone image above. In Bootstrap 4, you can move columns to right using offset-* class. This is one of the great features of bootstrap as it increase the left margin of a column. For instance, if you have a column that you want to offset or simply to put a gap within you can simply use this feature. As an example, let’s say we want to move four columns to the right in small display we can use col-sm-offset-4 to achieve this. See the code below. The result of the code above look like this image. Bootstrap offers a feature where in you can nest your content with the default grid. By creating a new row within an existing column you can then fill this row with some custom columns which can also span within the 12 scale column and is limited to its parent’s width. As you can inside the column one we created a new row and added three additional col-sm-3 classes. This means that we will be having additional three columns inside column one. So the code we have above will output the image below. 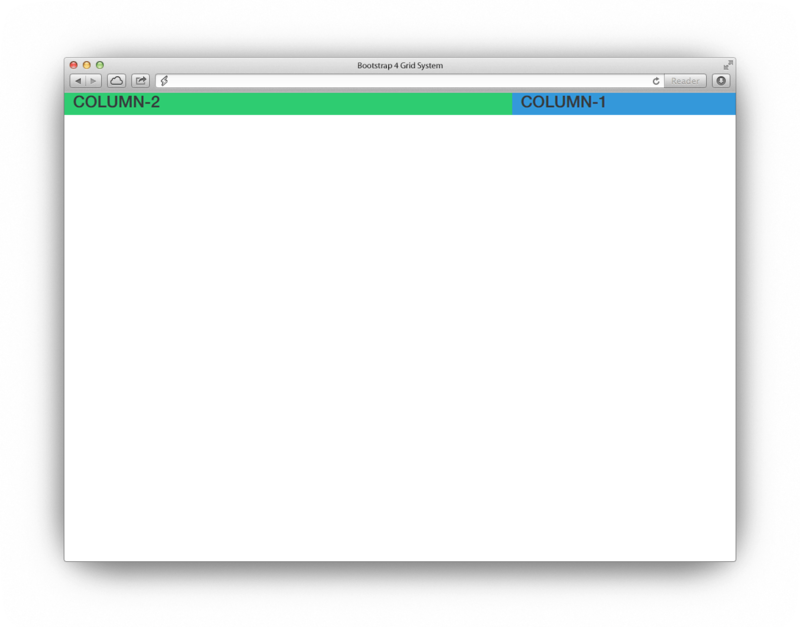 Column ordering classes enables us to change the order of our grid system based. This will allow us to have a different view on a large screen, and then a different view on a mobile screen. To do this we need to use the class col-column size-pull-* and col-column size-push-* to move column to to left and right. Let’s have an example. For instance, we will create two columns: col-md-4 and col-md-8. See code below. As you can see we have the two columns. Now let’s push column one to the right on medium size screens by eight columns and let’s pull column two to the left by four columns on medium size screens. See the code below. With the code above we have successfully pushed column one to the right and column two to the left. So our code will look like this on medium screens. 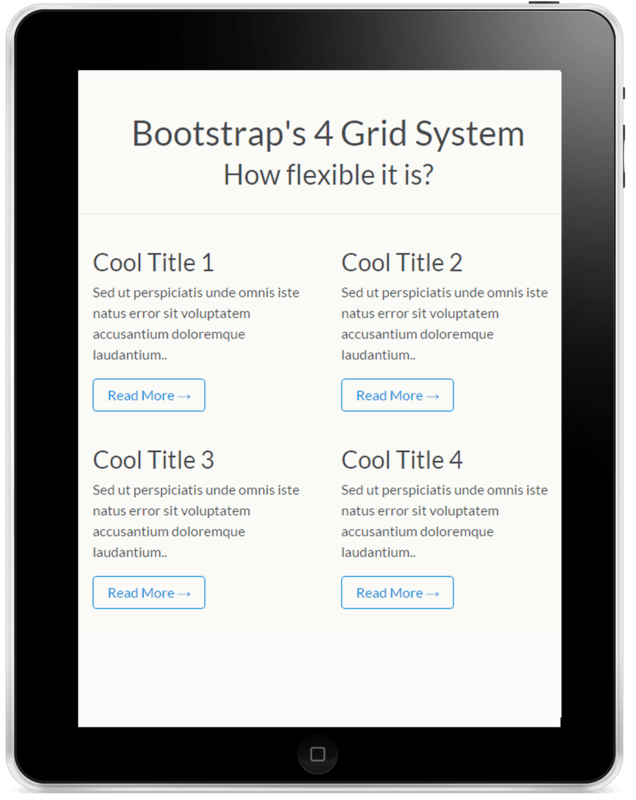 The default grid system of Bootstrap 4 utilizes 12 columns that can help you create any kind of website layout depending on the design. Modern websites use Bootstrap to create beautiful responsive websites at ease. After the release of Bootstrap Alpha 4, there are several things that makes it more powerful as it enhance it support to different mobile viewports. You can always check out their documentation here. Sam is a web designer and a front web developer with over 2 years of experience in the industry. Have a passion for designing detailed, creative and modern websites & graphics. He spend most of his time practically every day, experimenting with HTML, CSS and WordPress. Hi! Great walkthrough of these features. One thing I’m really excited about that you may have forgotten to add is the optional Flexbox Grid support that comes with Bootstrap 4.
on sm and xs screens? Thank you.